The MK Dons dressing room is hurting, but they aren't getting desperate just yet, according to keeper Lee Nicholls. 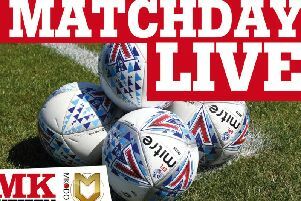 Dons have picked up nine points from 39 in a dismal run which has seen them win just one league game in 13 attempts, seeing them plummet to 20th in League 1, just three points above AFC Wimbledon in the final relegation spot. "It's hurting a little bit, and a bit low on confidence at the minute," said Nicholls on Thursday. "I don't think we're panicking yet, because we all know we shouldn't be in this position but it's up to us to get out of it. "We're not desperate yet - we know there's a lot of games to be played. We have to work hard, do the right things in training, prepare properly and making sure we play to the best of our abilities." Nicholls went on to say how disappointing the Christmas period has been for the club, but said with the tight nature of League 1 - 10 points separate Charlton in ninth and Dons in 20th - a few positive results will see them looking back up the table rather than over their shoulders. He added: "It has (been disappointing). To be fair, we've worked hard but things haven't gone our way. Performances haven't been too bad but we just need to pull together now. We all know we've got enough and the position we're in doesn't reflect where we should be. "We're not a million miles away from the teams above us. we've just got to get a few wins on the board - if we were to win three on the bounce, we would be looking back up the table instead of below us."